When it comes time to move, or even if you just plan to visit a new city, you want to make sure you pick the right neighborhood to go to. As with any large city, crime in Chicago is higher than it might be in neighboring towns or suburbs. There are several types of crime, but one that is especially important to consider is violent crime. In recent years the Windy City has captured national attention for rising rates. 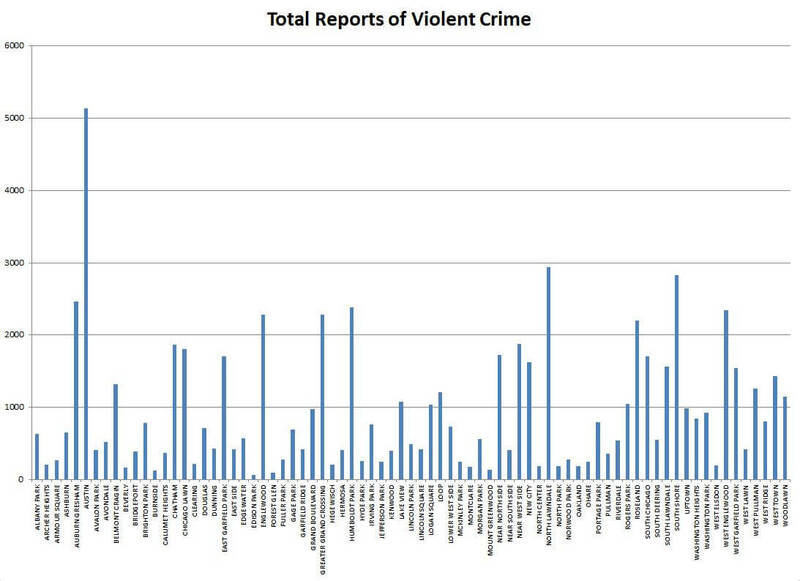 Utilizing data obtained from the Chicago Police Department, violent crimes against humans were analyzed. Violent crimes committed against another person include the crimes of assault, battery, criminal sexual assault, homicide, human trafficking, kidnapping, and sexual offense. In 2016, there were 72,240 violent crimes reported in the city of Chicago. This included 50,228 batteries, 1,433 criminal sexual assaults, 770 homicides, 11 human trafficking incidents, 203 kidnappings, 901 sexual offences, and 18,694 assaults. Certain neighborhoods have higher concentrations of violent crimes. The map below details the 77 official communities in the City of Chicago. 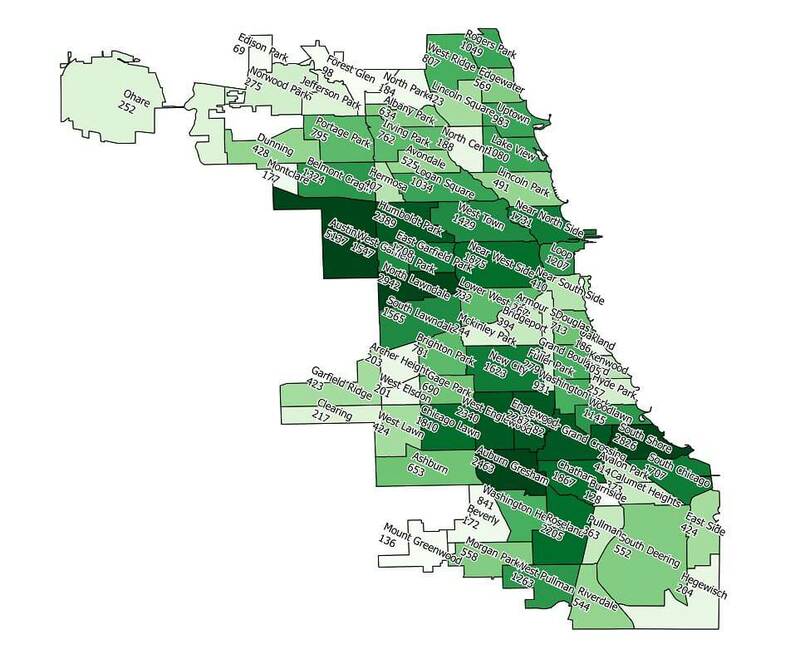 The areas with a darker concentration of green show which neighborhoods had the most reports of violent crimes against another person in 2016. The Austin neighborhood led all of Chicago’s 77 communities in violent crime. It reported over 2,100 more violent crimes than the second most violent neighborhood, North Lawndale. In 2016, Austin had 1234 assaults, 3680 batteries, 81 criminal sexual assaults, 88 homicides, 1 incidence of human trafficking, 5 kidnappings, and 48 reports of sexual offences. In comparing CPD data from 2015, Austin saw a 6% increase overall in violent crime in the Austin neighborhood. While Edison Park had the fewest reports of violent crime, the neighborhood saw a 1% increase in violent crimes in 2016 from 2015. The community reported 18 assaults, 49 batteries, 1 criminal sexual assault, and 0 reports of homicide, human trafficking, kidnapping, and sexual offense. The communities with the fewest reports of homicide include Burnside, Edison Park, Montclare, Forest Glen, Mount Greenwood, North Center, Hegewisch, North Park, O’Hare, Clearing, Beverly, and Lincoln Park. All had 0 homicides in 2016. 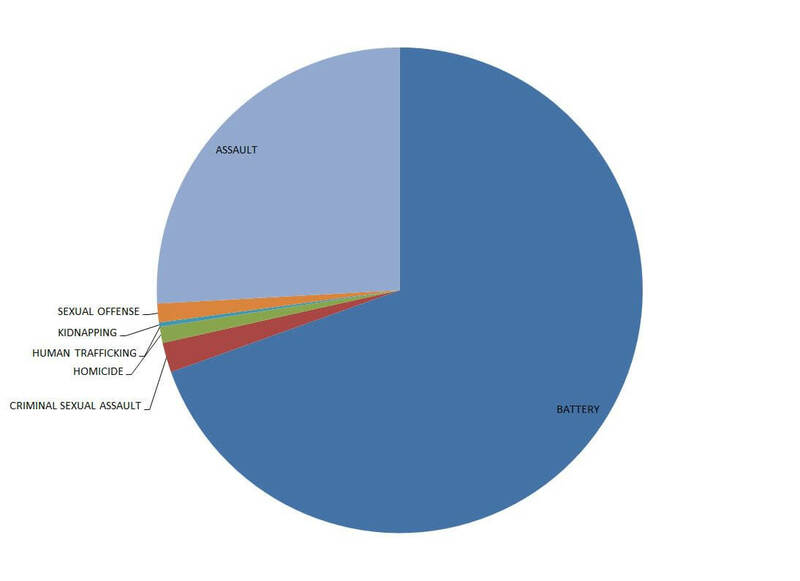 The communities with the fewest reports of kidnapping include Burnside, Edison park, Montclare, Forest Glen, Mount Greenwood, Hegewisch, North Park, O’Hare, Hyde Park, Armour Square, Archer Heights, Kenwood, Fuller Park, West Lawn, and Hermosa. All had 0 kidnappings in 2016. The communities with the most reports of human trafficking include Humboldt Park, Englewood, South Chicago, Austin, West Englewood, Roseland, Woodlawn, the Loop, West Garfield Park, Near West Side, and Grand Boulevard. All had 1 case of human trafficking. The rest of the communities in Chicago reported 0 cases of human trafficking. Sample size may have played a large role in the percentage increase and decrease in overall violent crime. 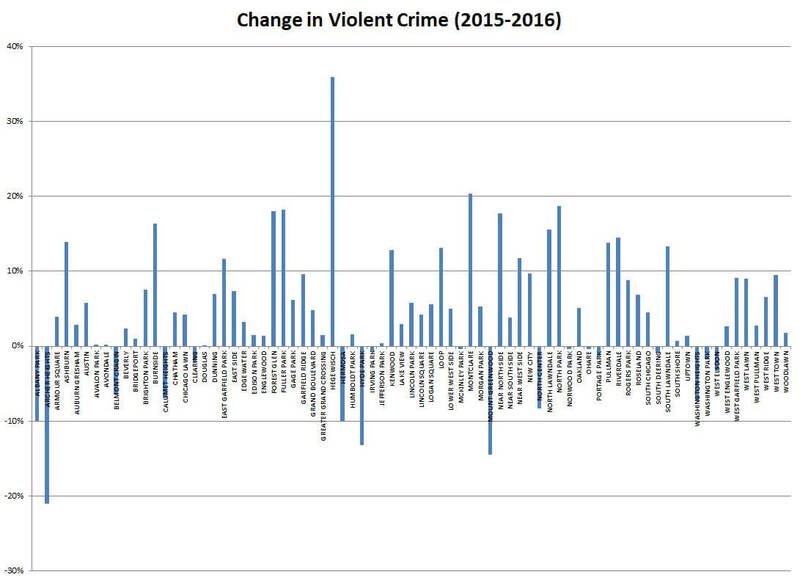 In communities that had very few incidents of violent crime in 2015, a small increase in violent crime can result in a large percentage increase. This is probably why some of the neighborhoods with the most reports of violent crime did not see high percentage increases.